The fishing vessels pulling up to the company wharf take anywhere from 300 pounds to 30 tons of ice per fishing trip. The company is open year round, and round-the-clock for commercial appointments. Cape Pond Ice can pump at a ton per minute on up to three fishing vessels at a time, as well as loading tractor trailers and trucks with either block ice or blown crushed ice . 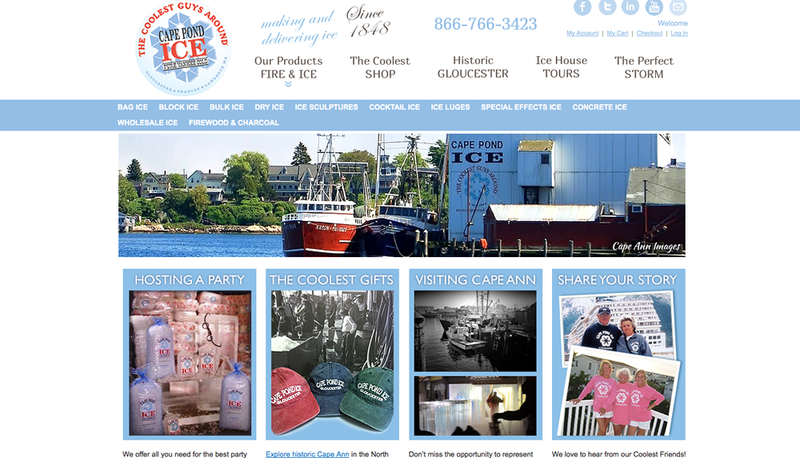 Pallets of 30 pound, 40 pound and 5 pound bagged ice are shipped around Cape Ann and New England. In addition to commercial fishing vessels and processors, the company serves broccoli and poultry farmers, redi-mix concrete contractors, and custom ice sculpture markets. Ice used by contractors working in Boston on the Third Harbor Tunnel and Central Artery, to slow the curing temperature of large concrete pours, has helped in offsettting declines from fishing.